Here you can find a strain description about Burnt Cookie and also some user-based reviews and infos directly from the SeedFinder (if available). You can also find the offers and auctions here if Burnt Cookie cannabis seeds are on stock at MyCannapot right now. Burnt Cookie, one of the original cuts of GSC from Harborside crossed with Black Rose F11. Plants will turn purple without cold. Easy grower. Almost everyone knows about the GSC strain but the Black Rose is known for its beauty, with some of the darkest purple buds of any strain. 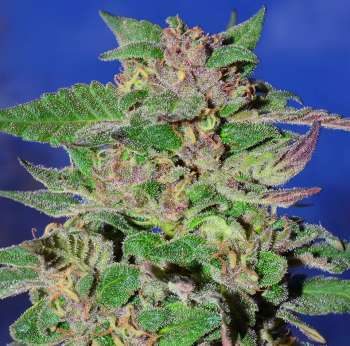 Black Rose from the UK breeder Heath Robinson, is a combination of Nebu's Black Russian and a Purple Shiva Skunk, and it has phenotypes ranging from Blackberry and Currant smells. Mixing it with GSC adds an extra sweetness that will sneak up and knock you out. Medium yield. High THC low CBD. Outdoors she can easily reach 10' heights and is ready for harvest in early October. Burnt Cookie is excellent medication for chronic pain, insomnia, stress, PTSD and depression. Also helps with suffering from fibromyalgia and PMS. Flowering period is 8-9 weeks to finish. Buy Burnt Cookie now at MyCannapot! There are no actual running auctions for Burnt Cookie right now.